Do you remember your first love? Was it Puppy Love? With Valentine’s Day coming up – there is sure to be plenty of Puppy Love Puppy Valentines! 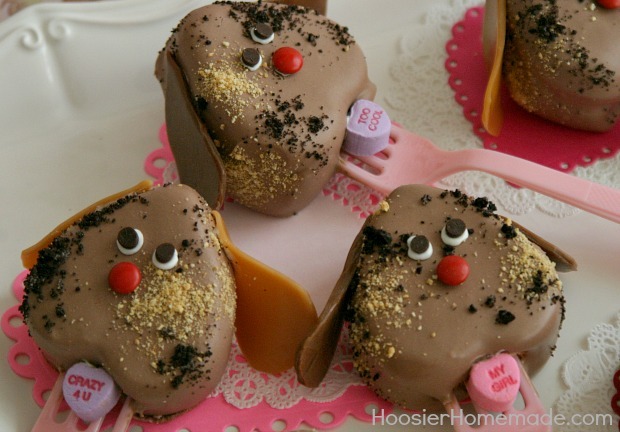 These Puppy Love Pops are just the cutest ever! 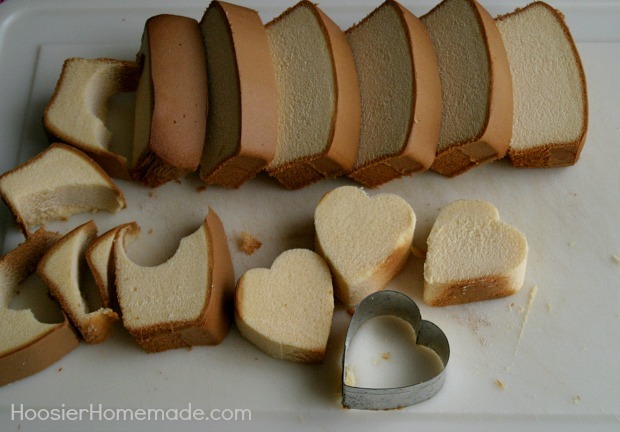 They are not as difficult to make as you might think, with just a few simple supplies you can create them for your kids, a Classroom Treat or even your sweetie! So how about if I show you how to make them? 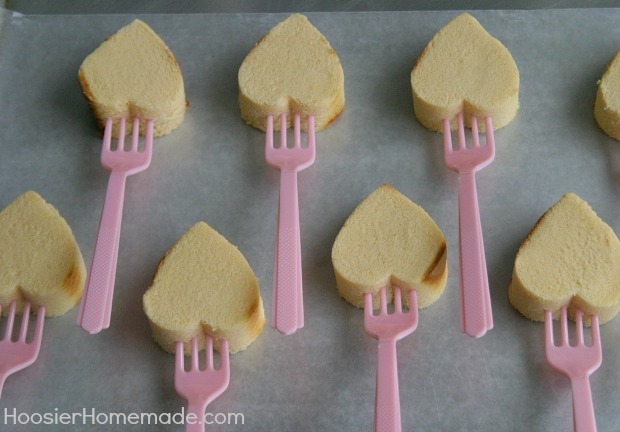 Cut 1/8 inch off each end of the pound cake, then cut into 1 inch – the cake I bought had handy little marks every inch. 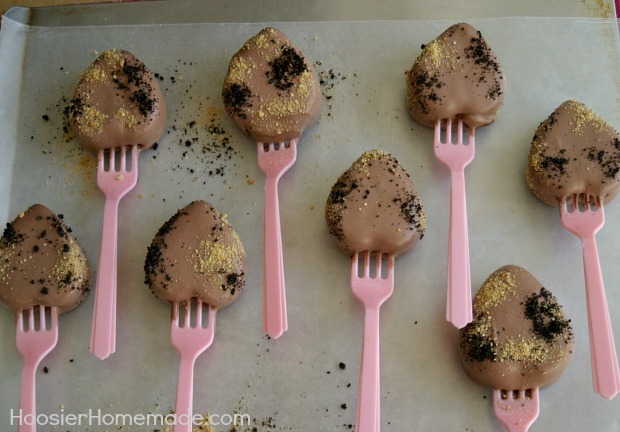 Using a 2 inch heart shaped cookie cutter, cut out hearts. The book says you can get 2 hearts from every piece of cake, I was only able to get 1, so it definitely depends on the size and shape of your cookie cutter. Meanwhile, make the ears, soften caramels and Tootsie Rolls, one at a time, in the microwave 3-6 seconds, be careful handling them. 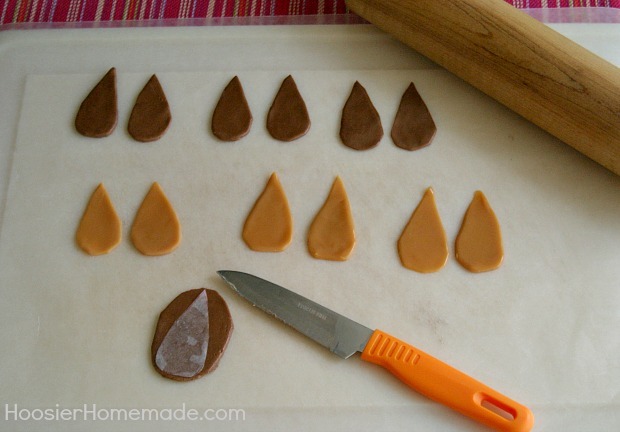 Roll out with a rolling pin and cut out a tear drop shape. I made a template with parchment paper. Lay on wax paper and set aside. Crush graham crackers and oreos and place in small bowls. Reserve about 1/4 cup vanilla frosting for decorating the face. 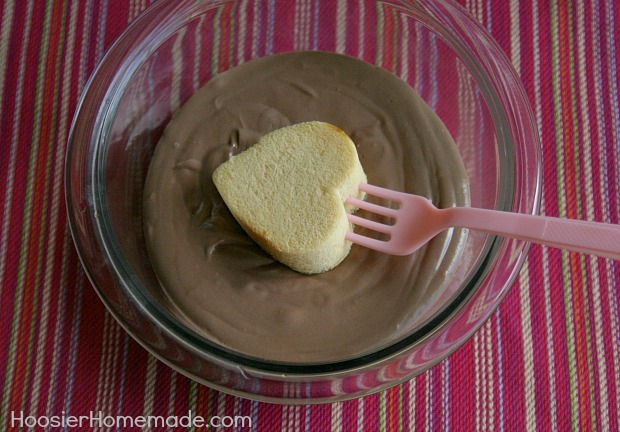 Dip cake into frosting, coating both sides. 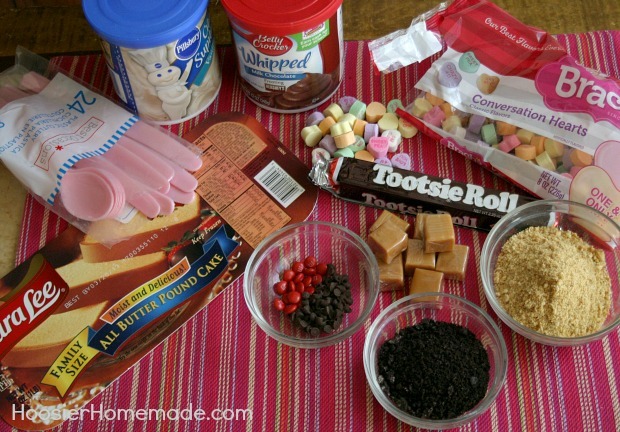 Sprinkle with crumbs, and place on wax paper. Put back into freezer. I found it best to let them freeze another 15 minutes or so, they were easier to handle. Then with the reserved vanilla frosting, add the nose, eyes, mouth and ears. Just adorable!! 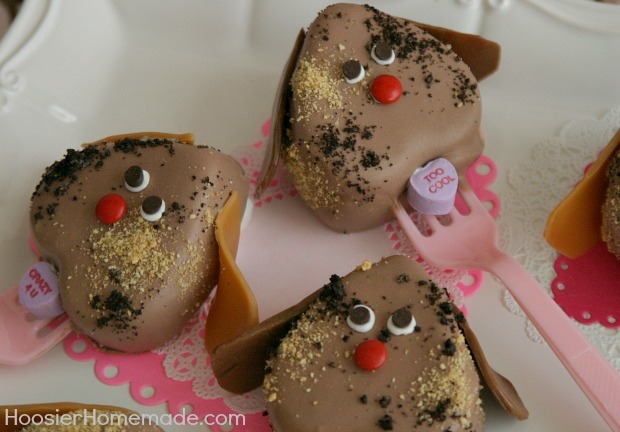 Puppy Love Pops from Cupcakes, Cookies & Pie, oh my! 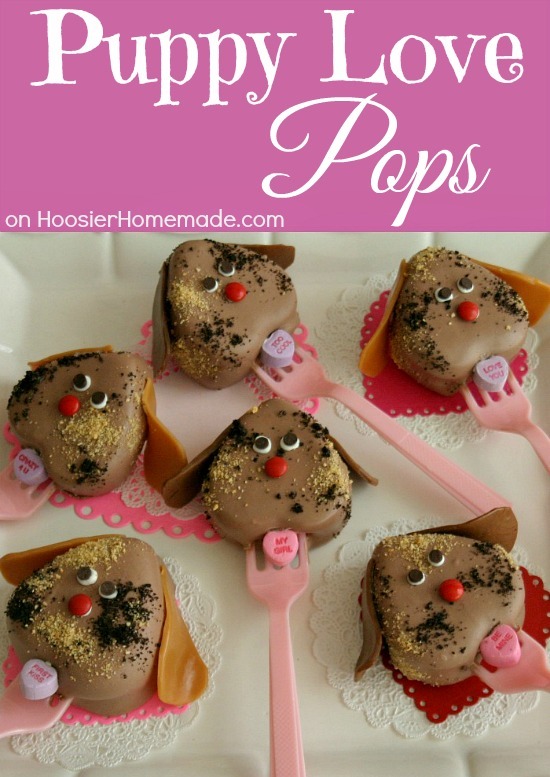 These are the CUTEST pup pops ever! I have a serious case of puppy love! Those puppy pops are TOO CUTE! I’m going to have to make these with my daughter. Adorable! Oh My GOSH! Those cupcakes are so cool! Would you come over to Cast Party Wednesday and share it? Sooo, Sooo Cute! I just bought the book … I couldn’t resist. I love your new look! Forgot to mention my favourite cupcake is the snowmen 🙂 or even the little hamburgers, super cute for the summer too. 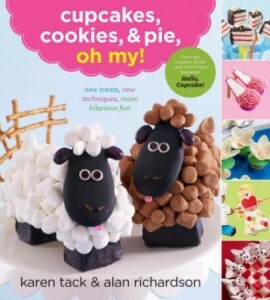 I cant wait to get this book, or win it 🙂 Since I got their newsletter annoucing it, I fell in love with the new ideas and the baabaa video is so cute. I like the snickerdoodle cupcakes with the cookie on top as garnish! YUM! i cant wait to get this book. you make everything look so easy for a beginner like me ! I love the puppy pops! I am just now finding your blog, how fun! Thanks for hosting! I love your new look! The Puppy Love Pops are adorable too! Just got my copy of the book this morning! Love it!